Here is a new post FX shader, that will take place in Geeks3D’s shader library. This shader shows how to implement a Predator-like thermal vision post processing effect in GLSL (the real time shading language of OpenGL). Python so you can use the version of GeeXLab without Python. Reminds me my first serious Radeon, the Radeon 9700 PRO, versus the GeForce 4… Radeon cards are rather powerful when we talk about VBO rendering. The main graphics work of this demo is the rendering of the Qoob mesh (made up of 79’874 vertices and 159’744 triangles). And I must say that AMD cards are still very fast when it comes to vertex processing! 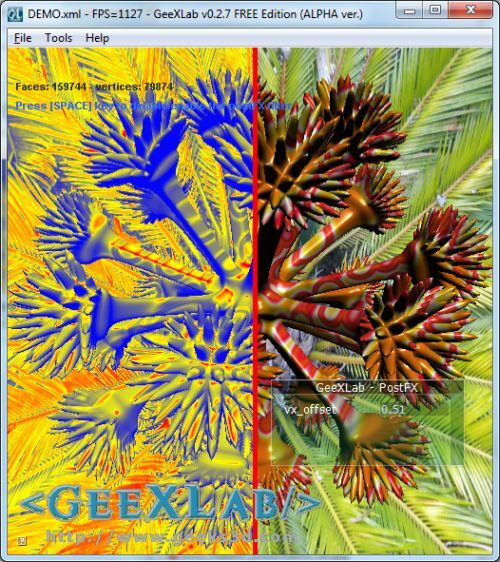 This thermal vision shader is a modified version for GeeXLab of Agnius Vasiliauskas‘s original work. The shaders are fab, but where do you generate your funky geometries? Are they generated by code that is part of GeeXLab? I wonder is the gray scale conversion correct. Seems like there are two ranges out there “0.222, 0.707, 0.071” and “0.30, 0.59, 0.11”. In gpu gems the former is used (http://http.developer.nvidia.com/GPUGems/gpugems_ch22.html) while you choose the latter. Which is the correct one to use? we all knew that VBO was faster on ATI, but just couldnt ever get it to run! you’re using DirectX for this are you not JeGX? err answered that question myself! Would it be difficult to make a convert of this code to Adobe Pixel Bender ?